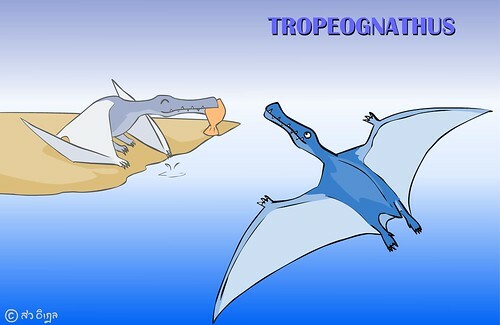 Tropeognathus’s name is not so welknown, but this pterosaur performs as the main animal in one of the world most famous movies, called “Avatar”. Tropeognathus had sharp teeth and long jaw. This sharp teeth might help it to get the bigger fish than the non-teeth pterosaur could do. Roll mouse over the small dinosaur, you will see it eats the fish.